Beautifully Updated 3 Bedroom Ranch. As You Enter This Lovely Home You'll be Amazed by the Newly Refinished Hardwood Floors. The Updated Kitchen Offers New Granite Counters, Stainless Steel Appliances, Breakfast Bar and Spacious Breakfast Room with New Patio Door Leading to the Deck Overlooking the Private Level Yard Which Features a Brick Patio, Pond with Fountain, Shed and it's Totally Fenced. Back Inside to the Fantastic Finished Lower Level, You Won't Believe All the Additional Space with a Large Family Room that Boasts a Gas Fireplace and Wet Bar, Spacious Rec Room, 4th Bedroom or Office, 1/2 bath and Plenty of Storage Space. This Lovely Home Also Features New White 6 Panel Doors, Low E Vinyl Windows and Freshly Painted Through-Out. Note: There is Hardwood Under Carpet in Bedrooms. Fantastic Location Just Minutes From the Maryland Heights Community Center/Aquaport and Dog Park. 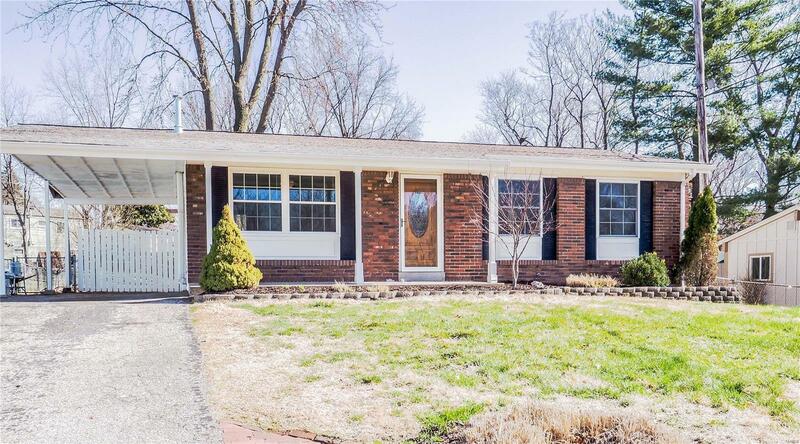 Nearby Creve Coeur Lake and Beautiful Parks. Come Take a Look, This One Won't Last Long!! Elementary School: Rose Acres Elem.